(CNN) -- Democrat Al Franken has pulled ahead of incumbent Republican Sen. Norm Coleman in Minnesota's still unresolved U.S. Senate race, according to a running tally on the Minneapolis Star Tribune's Web site. Republican Sen. 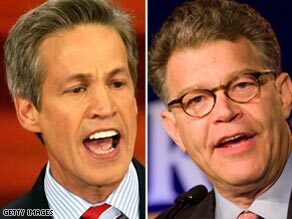 Norm Coleman, left, and Democrat Al Franken have swapped leads in Minnesota's Senate race. Late Friday morning, the newspaper's tally put Franken ahead by 102 votes. Coleman's lead had fallen to single digits Thursday evening. But the race remains fluid: The results reported by the newspaper are ongoing, with hundreds of challenged ballots still to be reviewed. Minnesota Secretary of State Mark Ritchie has said that he and four other members on the Canvassing Board will not end their workday until all remaining challenges have been reviewed. One major wild card that remains are roughly 4,000 ballots that were originally challenged by the campaigns, who have since withdrawn those challenges. The secretary of state's office has yet to declare how or when those ballots will be awarded to the candidates. About 3 million votes were cast in the election, and the close result tripped an automatic recount. Franken, a former "Saturday Night Live" comedian and writer, gained several hundred votes Thursday night as the board ruled on ballot challenges from both sides, the newspaper reported. "When the recount is over and all the votes that were legally cast are counted, Al Franken will have won this election and will be declared the winner," Marc Elias, Franken's lead recount attorney, told the newspaper.